I never posted burger bun test #1 because it was such an epic failure. It was an attempt to make french bread rolls which did not turn out too well. They tasted fine but they never got bigger than a bouncy ball from one of those coin machines. This time I tested out a recipe from Epicurious that was supposed to make for a tasty burger bun. It certainly made for a delicious dinner roll, but burger bun it is not. 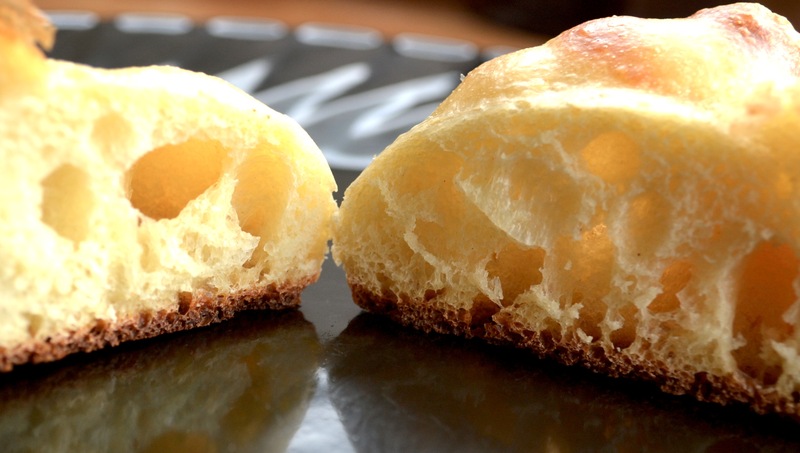 The texture of the rolls was very dependent on where they were placed in the oven. 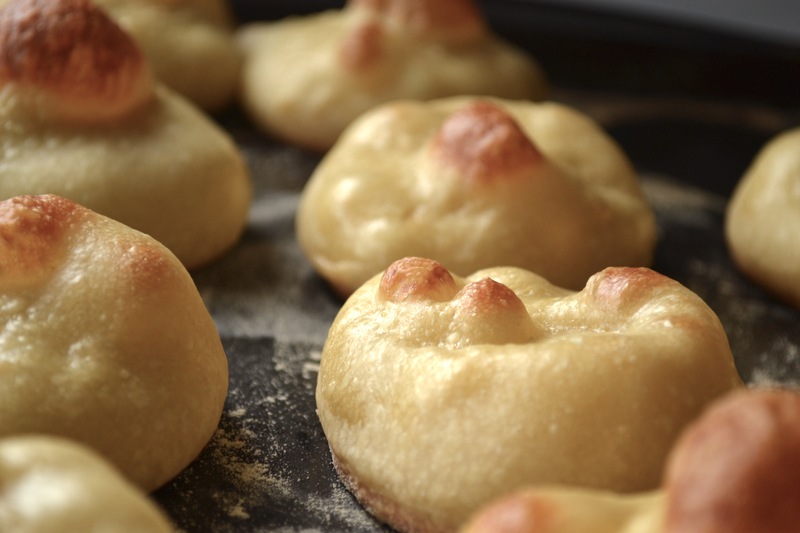 The rolls cooked at the bottom of the oven got these cute, bulbous sore like things on them and a nice shiny glow. They matched well with the burger I cooked this morning with BBQ sauce, avocado, and an Australian cheddar cheese. According to Andrew, the texture of these was much better than the texture of the other batch. Now these were the rolls that I baked in the center rack of the oven. They definitely came out less airy, but with a decidedly more burger bun appearance. I didn’t think they tasted any different than the ones cooked on the bottom rack, but their texture was definitely less airy and more dense. Onto the insides. There are definitely some visual differences between these two. The exterior has a nice, shiny finish from the egg wash that I gave it. The inside is very airy with the exterior texture being chewy. 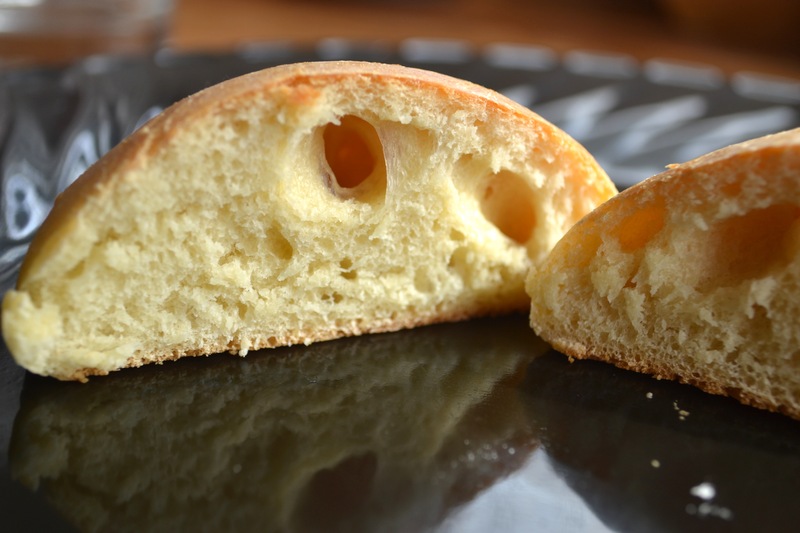 As I stated before, an excellent dinner roll, but definitely not what I’m looking in a burger bun. It was lacking a crumb of any kind and was far too dense. The exterior finish is dull. The interior does have some air pockets, but not as many as the other batch. I didn’t mind the texture or the taste of these, but I enjoy a dense bread with some tooth to it. Andrew did not like the texture of it at all. Add butter, warm milk, and remaining 1/4 cup sugar to yeast mixture and mix with paddle attachment at low speed until butter has melted, then mix in eggs until combined well. Add salt and 4 cups flour and mix, scraping down side of bowl as necessary, until flour is incorporated. Beat at medium speed 1 minute. Transfer dough to a lightly oiled large bowl and turn to coat. Cover tightly with plastic wrap and let rise in a warm draft-free place until doubled, about 2 1/2 hours. Butter 2 large baking sheets. Punch down dough, then roll out on a lightly floured surface with a floured rolling pin into a 14-inch round (about 1/2 inch thick). Cut out as many rounds as possible with floured cutter and arrange 3 inches apart on baking sheets. Gather and reroll scraps, then cut out more rounds. Loosely cover buns with oiled plastic wrap and let rise in a draft-free place at warm room temperature until they hold a finger mark when gently poked, 1 1/2 to 2 hours. 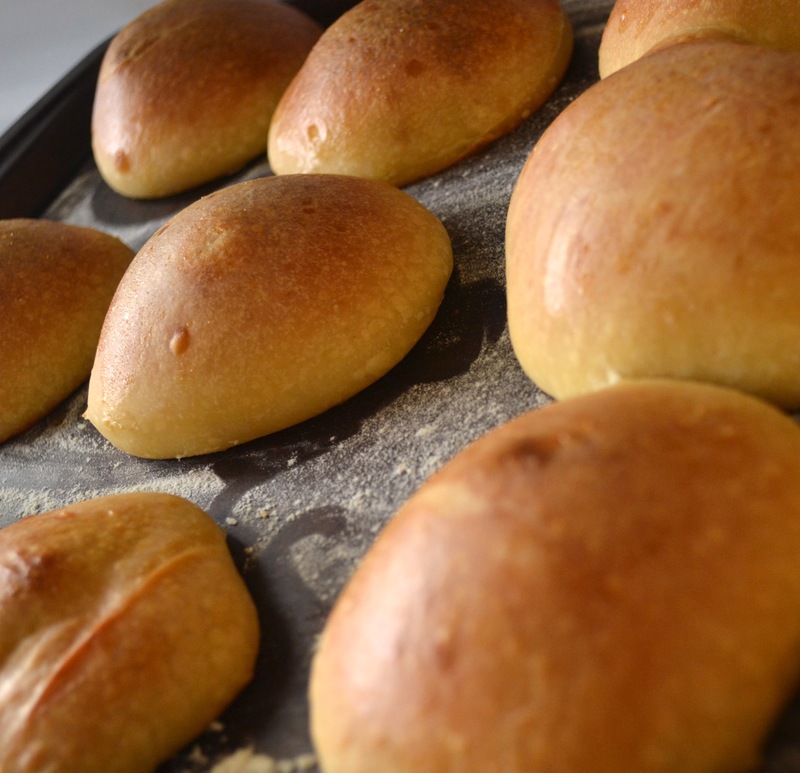 Brush buns with egg wash and bake, switching position of sheets halfway through baking, until tops are golden and undersides are golden brown and sound hollow when tapped, 14 to 20 minutes. Transfer to racks to cool completely.